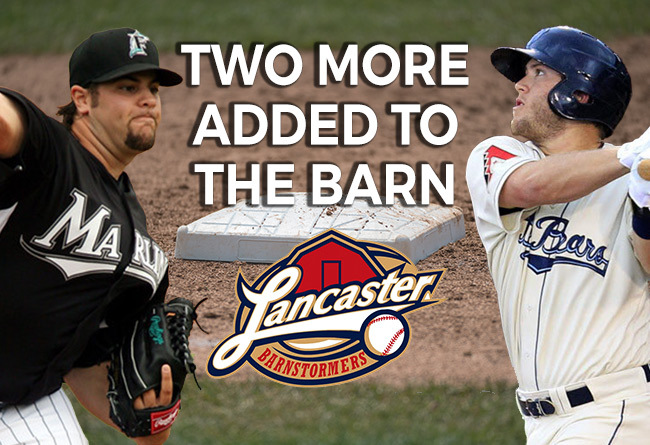 (Lancaster, Pa., Feb. 14, 2017) - Right-handed pitcher Elih Villanueva and versatile infielder Garrett Weber have signed contracts to play for the Lancaster Barnstormers in 2017, it was announced today by manager Ross Peeples. Both are coming to the Atlantic League for the first time. Villianueva, 30, is known for his durability, having thrown more than 150 innings in four of the last eight seasons. He threw a career-high 179 innings for Class AA Jacksonville in 2010 and nearly matched it with 168 innings in the Baltimore organization in 2015. The Miami native signed with the Marlins in 2008, spending seven seasons in the Miami system. His best season came in 2010, when he went 14-4 with a league-leading 2.26 ERA in his 28 appearances. During that season, he allowed only 137 hits and 34 walks in his 179 innings of work. Villanueva threw three complete game shutouts that season and was named to the Southern League’s year-end All-Star team. Villanueva spent most of the next four years with Class AAA New Orleans, posting a combined record of 28-32. He made one Major League start for the Marlins, losing to the Philadelphia Phillies on June 15, 2011. In 2015, the right-hander was a combined 12-12 with a 3.54 ERA between Class AA Bowie and Class AAA Norfolk. He went to Taiwan last season but was injured in spring training. Weber, who will turn 28 by Opening Day, spent five seasons in the Arizona system after signing out of Cal State-Fresno. His premier season came in 2014, when he hit a combined .318 with nine homers and 48 RBI in 111 games between Class AA Mobile and Class AAA Reno. The right-handed hitter followed that season with a .302 mark in 2015, split between the same two levels. He spent the 2016 season with the Texas and Miami systems. In Weber’s career, he has played all four infield positions as well as 60 games in left field. His career fielding percentage at second base, his most commonly played position, is an impressive .982. Lancaster now has 10 players under contract for the upcoming season. The Atlantic League has been a leader in professional baseball and a gateway to Major League Baseball since 1998. Over 36 million fans have attended Atlantic League games and more than 800 players and 50 managers and coaches have joined MLB organizations directly from the ALPB. The Atlantic League emphasizes winning baseball games, showcasing the talent of topcaliber players and offering affordable family entertainment to metropolitan markets serving nearly 15% of the US population.